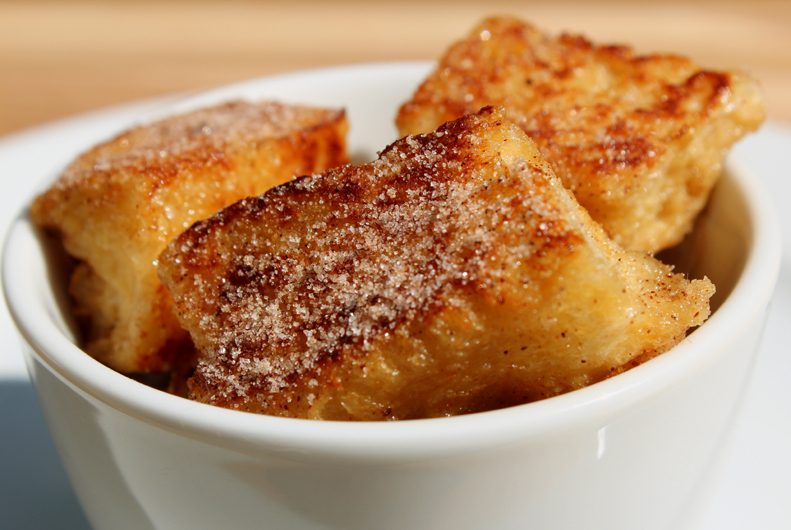 Happiness Project Recipe #17: Cinnamon French Toast Niblets! First, break out your cutting board & a large serrated knife to chop up your bread loaf of choice. Next, in a medium size bowl, stir together the granulated sugar and cinnamon. Set aside. In a 2nd bowl, whisk together the eggs, buttermilk, milk, vanilla and salt until nicely blended. Place the bread cubes in the egg mixture and using a large spoon, toss gently until the cubes are thoroughly coated and the egg mixture has been completely absorbed. In a large non-stick frying pan over medium heat, melt one tablespoon of the butter. Drop half of the coated bread cubes into the pan and cook, turning often, until golden brown on each side, for about 8-10 minutes. When your 1st batch of bread cubes is nicely cooked up to your desired preference, move them to a dry bowl or plate on the side and repeat with the remaining bread cubes and 1 tablespoon of butter. Once all of your cubes are cooked, sprinkle on the cinnamon sugar, using as little or as much as you like. Now, serve, with your favorite syrup and/or a little spoonful of powdered sugar and nibble, nibble away! « Happiness Project Recipe #16.5: Peanut Butter Chocolate Chip Granola Bars!